Oscar The Grouch Wasn’t Originally Green, But? The Speed Of A Computer Mouse Is Measured In What Unit? The iconic children’s show Sesame Street has been on the air for over forty years, and for every one of those years, the grumpy lives-in-a-trash-can Oscar the Grouch has been as green as the leaves of the city street he lives on—all those years except for the first one, that is. 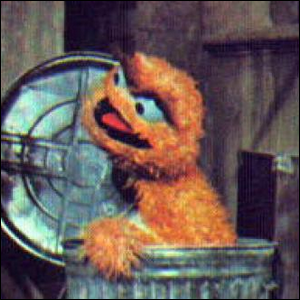 In the very first season of Sesame Street, Oscar the Grouch wasn’t green at all. He was a brilliant shade of orange that one might expect to find available only in a mid-century shag carpet. Stranger yet, Oscar wasn’t even originally intended to be green or orange, but magenta. In the earliest design sketches of the Sesame Street muppets, Oscar’s original shade was a rich magenta color. Why doesn’t he appear magenta in a single episode? Early color televisions had trouble displaying the bright purple color and they scrapped magenta for orange. After the first season, Jim Henson himself decided that orange just didn’t look right and they switched his fur to green. If you’re worried that kids were confused by the change, don’t be—they explained it away with a simple premise. Oscar had gone on vacation to Swamp Mushy Muddy and something unspecified about the experience turned his fur green.